This article is about the geological period. For the residents of the English county, see Devon. The period is named after Devon, a county in southwestern England, where a controversial argument in the 1830s over the age and structure of the rocks found distributed throughout the county was eventually resolved by the definition of the Devonian period in the geological timescale. The Great Devonian Controversy was a long period of vigorous argument and counter-argument between the main protagonists of Roderick Murchison with Adam Sedgwick against Henry De la Beche supported by George Bellas Greenough. Murchison and Sedgwick won the debate and named the period they proposed as the Devonian System. While the rock beds that define the start and end of the Devonian period are well identified, the exact dates are uncertain. According to the International Commission on Stratigraphy (Ogg, 2004), the Devonian extends from the end of the Silurian 419.2 Mya, to the beginning of the Carboniferous 358.9 Mya (in North America, the beginning of the Mississippian subperiod of the Carboniferous). The Devonian has also erroneously been characterised as a "greenhouse age", due to sampling bias: most of the early Devonian-age discoveries came from the strata of western Europe and eastern North America, which at the time straddled the Equator as part of the supercontinent of Euramerica where fossil signatures of widespread reefs indicate tropical climates that were warm and moderately humid but in fact the climate in the Devonian differed greatly during its epochs and between geographic regions. For example, during the Early Devonian, arid conditions were prevalent through much of the world including Siberia, Australia, North America, and China, but Africa and South America had a warm temperate climate. In the Late Devonian, by contrast, arid conditions were less prevalent across the world and temperate climates were more common. The Devonian Period is formally broken into Early, Middle and Late subdivisions. The rocks corresponding to those epochs are referred to as belonging to the Lower, Middle and Upper parts of the Devonian System. The Early Devonian lasted from 419.2 ± 2.8 to 393.3 ± 2.5 and began with the Lochkovian stage, which lasted until the Pragian. It spanned from 410.8 ± 2.8 to 407.6 ± 2.5, and was followed by the Emsian, which lasted until the Middle Devonian began, 393.3± 2.7 million years ago. During this time, the first ammonoids appeared, descending from bactritoid nautiloids. Ammonoids during this time period were simple and differed little from their nautiloid counterparts. These ammonoids belong to the order Agoniatitida, which in later epochs evolved to new ammonoid orders, for example Goniatitida and Clymeniida. This class of cephalopod molluscs would dominate the marine fauna until the beginning of the Mesozoic era. The Middle Devonian comprised two subdivisions: first the Eifelian, which then gave way to the Givetian 387.7± 2.7 million years ago. During this time the jawless agnathan fishes began to decline in diversity in freshwater and marine environments partly due to drastic environmental changes and partly due to the increasing competition, predation and diversity of jawed fishes. The shallow, warm, oxygen-depleted waters of Devonian inland lakes, surrounded by primitive plants, provided the environment necessary for certain early fish to develop such essential characteristics as well developed lungs, and the ability to crawl out of the water and onto the land for short periods of time. Finally, the Late Devonian started with the Frasnian, 382.7 ± 2.8 to 372.2 ± 2.5, during which the first forests took shape on land. The first tetrapods appeared in the fossil record in the ensuing Famennian subdivision, the beginning and end of which are marked with extinction events. This lasted until the end of the Devonian, 358.9± 2.5 million years ago. The continent Euramerica (or Laurussia) was created in the early Devonian by the collision of Laurentia and Baltica, which rotated into the natural dry zone along the Tropic of Capricorn, which is formed as much in Paleozoic times as nowadays by the convergence of two great air-masses, the Hadley cell and the Ferrel cell. In these near-deserts, the Old Red Sandstone sedimentary beds formed, made red by the oxidised iron (hematite) characteristic of drought conditions. Near the equator, the plate of Euramerica and Gondwana were starting to meet, beginning the early stages of the assembling of Pangaea. This activity further raised the northern Appalachian Mountains and formed the Caledonian Mountains in Great Britain and Scandinavia. The west coast of Devonian North America, by contrast, was a passive margin with deep silty embayments, river deltas and estuaries, found today in Idaho and Nevada; an approaching volcanic island arc reached the steep slope of the continental shelf in Late Devonian times and began to uplift deep water deposits, a collision that was the prelude to the mountain-building episode at the beginning of the Carboniferous called the Antler orogeny. Sea levels were high worldwide, and much of the land lay under shallow seas, where tropical reef organisms lived. The deep, enormous Panthalassa (the "universal ocean") covered the rest of the planet. Other minor oceans were the Paleo-Tethys Ocean, Proto-Tethys Ocean, Rheic Ocean, and Ural Ocean (which was closed during the collision with Siberia and Baltica). During the Devonian, Chaitenia, an island arc, accreted to Patagonia. Sea levels in the Devonian were generally high. 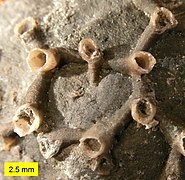 Marine faunas continued to be dominated by bryozoa, diverse and abundant brachiopods, the enigmatic hederellids, microconchids and corals. Lily-like crinoids (animals, their resemblance to flowers notwithstanding) were abundant, and trilobites were still fairly common. Among vertebrates, jawless armored fish (ostracoderms) declined in diversity, while the jawed fish (gnathostomes) simultaneously increased in both the sea and fresh water. Armored placoderms were numerous during the lower stages of the Devonian Period and became extinct in the Late Devonian, perhaps because of competition for food against the other fish species. Early cartilaginous (Chondrichthyes) and bony fishes (Osteichthyes) also become diverse and played a large role within the Devonian seas. The first abundant genus of shark, Cladoselache, appeared in the oceans during the Devonian Period. The great diversity of fish around at the time has led to the Devonian being given the name "The Age of Fish" in popular culture. By the Devonian Period, life was well underway in its colonisation of the land. 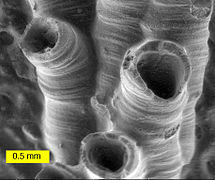 The moss forests and bacterial and algal mats of the Silurian were joined early in the period by primitive rooted plants that created the first stable soils and harbored arthropods like mites, scorpions, trigonotarbids and myriapods (although arthropods appeared on land much earlier than in the Early Devonian and the existence of fossils such as Climactichnites suggest that land arthropods may have appeared as early as the Cambrian). Also the first possible fossils of insects appeared around 416 Mya in the Early Devonian. Evidence for the earliest tetrapods takes the form of trace fossils in shallow lagoon environments within a marine carbonate platform/shelf during the Middle Devonian, although these traces have been questioned and an interpretation as fish feeding traces (Piscichnus) has been advanced. Many Early Devonian plants did not have true roots or leaves like extant plants although vascular tissue is observed in many of those plants. Some of the early land plants such as Drepanophycus likely spread by vegetative growth and spores. The earliest land plants such as Cooksonia consisted of leafless, dichotomous axes and terminal sporangia and were generally very short-statured, and grew hardly more than a few centimetres tall. By far the largest land organism during this period was the enigmatic Prototaxites, which was possibly the fruiting body of an enormous fungus, rolled liverwort mat, or another organism of uncertain affinities that stood more than 8 metres tall, and towered over the low, carpet-like vegetation. 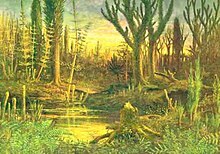 By the Middle Devonian, shrub-like forests of primitive plants existed: lycophytes, horsetails, ferns, and progymnosperms had evolved. Most of these plants had true roots and leaves, and many were quite tall. The earliest-known trees, from the genus Wattieza, appeared in the Late Devonian around 385 Mya. In the Late Devonian, the tree-like ancestral Progymnosperm Archaeopteris which had conifer-like true wood and fern-like foliage and the cladoxylopsids grew. (See also: lignin.) These are the oldest-known trees of the world's first forests. 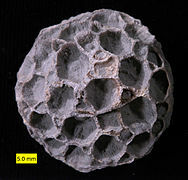 By the end of the Devonian, the first seed-forming plants had appeared. This rapid appearance of so many plant groups and growth forms has been called the "Devonian Explosion". The 'greening' of the continents acted as a carbon sink, and atmospheric concentrations of carbon dioxide may have dropped. This may have cooled the climate and led to a massive extinction event. See Late Devonian extinction. Primitive arthropods co-evolved with this diversified terrestrial vegetation structure. The evolving co-dependence of insects and seed-plants that characterised a recognisably modern world had its genesis in the Late Devonian period. The development of soils and plant root systems probably led to changes in the speed and pattern of erosion and sediment deposition. The rapid evolution of a terrestrial ecosystem that contained copious animals opened the way for the first vertebrates to seek out a terrestrial living. By the end of the Devonian, arthropods were solidly established on the land. 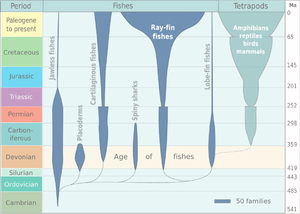 A major extinction occurred at the beginning of the last phase of the Devonian period, the Famennian faunal stage (the Frasnian-Famennian boundary), about 372.2 Mya, when all the fossil agnathan fishes, save for the psammosteid heterostraci, suddenly disappeared. A second strong pulse closed the Devonian period. The Late Devonian extinction was one of five major extinction events in the history of the Earth's biota, and was more drastic than the familiar extinction event that closed the Cretaceous. 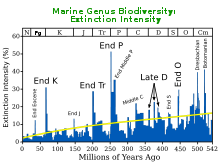 The Devonian extinction crisis primarily affected the marine community, and selectively affected shallow warm-water organisms rather than cool-water organisms. The most important group to be affected by this extinction event were the reef-builders of the great Devonian reef systems. 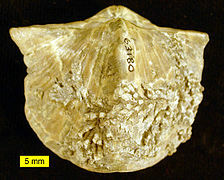 Amongst the severely affected marine groups were the brachiopods, trilobites, ammonites, conodonts, and acritarchs, as well as jawless fish, and all placoderms. Land plants as well as freshwater species, such as our tetrapod ancestors, were relatively unaffected by the Late Devonian extinction event (there is a counterargument that the Devonian extinctions nearly wiped out the tetrapods). Falls of the Ohio State Park, Indiana, USA. One of the largest exposed Devonian fossil beds in the world. 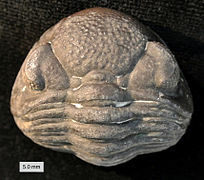 Phacops rana, a Devonian trilobite. ^ Parry, S. F.; Noble, S. R.; Crowley, Q. G.; Wellman, C. H. (2011). "A high-precision U–Pb age constraint on the Rhynie Chert Konservat-Lagerstätte: time scale and other implications". Journal of the Geological Society. London: Geological Society. 168 (4): 863–872. doi:10.1144/0016-76492010-043. ^ Kaufmann, B.; Trapp, E.; Mezger, K. (2004). "The numerical age of the Upper Frasnian (Upper Devonian) Kellwasser horizons: A new U-Pb zircon date from Steinbruch Schmidt(Kellerwald, Germany)". The Journal of Geology. 112 (4): 495–501. Bibcode:2004JG....112..495K. doi:10.1086/421077. ^ Algeo, T. J. (1998). "Terrestrial-marine teleconnections in the Devonian: links between the evolution of land plants, weathering processes, and marine anoxic events". Philosophical Transactions of the Royal Society B: Biological Sciences. 353 (1365): 113–130. doi:10.1098/rstb.1998.0195. ^ a b Gradstein, Felix M.; Ogg, J. G.; Smith, A. G. (2004). A Geologic Time Scale 2004. Cambridge: Cambridge University Press. ISBN 978-0521786737. ^ Amos, Jonathan. "Fossil tracks record 'oldest land-walkers'". news.bbc.co.uk. BBC News. Retrieved 24 December 2016. ^ Newitz, Annalee (2013-06-13). "How Do You Have a Mass Extinction Without an Increase in Extinctions?". The Atlantic. William Lonsdale stated that in December 1837 he had suggested the existence of a stratum between the Silurian and Carboniferous ones. See: William Lonsdale (1840) "Notes on the age of limestones from south Devonshire," Transactions of the Geological Society of London, 2nd series, 5 (part II) : 721-738 ; see especially pp. 724 and 727. From p. 724: " … Mr. Austen's communication [was] read December 1837, … . It was immediately after the reading of that paper … that I formed the opinion relative to the limestones of Devonshire being of the age of the old red sandstone; and which I afterwards suggested first to Mr. Murchison and then to Prof. Sedgwick, … ." ^ Gradstein, Felix M.; Ogg, James G.; Smith, Alan G. (2004). A Geologic Time Scale 2004. Cambridge University Press. ISBN 9780521786737. ^ "Devonian Period | geochronology". Encyclopedia Britannica. Retrieved 2017-12-15. ^ Benton, M. J. (2005) Vertebrate Palaeontology John Wiley, 3rd edition, page 14. ISBN 9781405144490. ^ "Palaeos Paleozoic: Devonian: The Devonian Period - 1". palaeos.com. Retrieved 24 January 2019. ^ Garwood, Russell J.; Dunlop, Jason (July 2014). "The walking dead: Blender as a tool for paleontologists with a case study on extinct arachnids". Journal of Paleontology. 88 (4): 735–746. Bibcode:1974JPal...48..524M. doi:10.1666/13-088. ISSN 0022-3360. Retrieved 2015-07-21. ^ Garwood, Russell J.; Edgecombe, Gregory D. (September 2011). "Early Terrestrial Animals, Evolution, and Uncertainty". Evolution: Education and Outreach. 4 (3): 489–501. doi:10.1007/s12052-011-0357-y. ISSN 1936-6426. Retrieved 2015-07-21. ^ Niedźwiedzki (2010). "Tetrapod trackways from the early Middle Devonian period of Poland". Nature. 463 (7277): 43–48. Bibcode:2010Natur.463...43N. doi:10.1038/nature08623. PMID 20054388. ^ Lucas (2015). "Thinopus and a Critical Review of Devonian Tetrapod Footprints". Ichnos. 22 (3–4): 136–154. doi:10.1080/10420940.2015.1063491. ^ Zhang, Ying-ying; Xue, Jin-Zhuang; Liu, Le; Wang, De-ming (2016). "Periodicity of reproductive growth in lycopsids: An example from the Upper Devonian of Zhejiang Province, China". 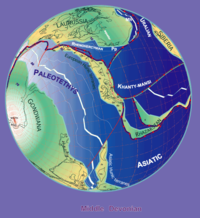 Paleoworld. 25 (1): 12–20. doi:10.1016/j.palwor.2015.07.002. ^ Gonez, Paul; Gerrienne, Philippe (2010). "A new definition and a lectotypification of the genus Cooksonia Lang 1937". International Journal of Plant Sciences. 171 (2): 199–215. doi:10.1086/648988. ^ Hueber, Francis M. (2001). "Rotted wood-alga fungus: The history and life of Prototaxites Dawson 1859". Review of Palaeobotany and Palynology. 116 (1–2): 123–159. doi:10.1016/s0034-6667(01)00058-6. ^ Graham, Linda E.; Cook, Martha E; Hanson, David T.; Pigg, Kathleen B.; Graham, James M. (2010). "Rolled liverwort mats explain major Prototaxites features: Response to commentaries". American Journal of Botany. 97 (7): 1079–1086. doi:10.3732/ajb.1000172. PMID 21616860. ^ Taylor, Thomas N.; Taylor, Edith L.; Decombeix, Anne-Laure; Schwendemann, Andrew; Serbet, Rudolph; Escapa, Ignacio; Krings, Michael (2010). "The enigmatic Devonian fossil Prototaxites is not a rolled-up liverwort mat: Comment on the paper by Graham et al. (AJB 97: 268–275)". American Journal of Botany. 97 (7): 1074–1078. doi:10.3732/ajb.1000047. PMID 21616859. ^ Smith, Lewis (April 19, 2007). "Fossil from a forest that gave Earth its breath of fresh air". The Times. London. Retrieved May 1, 2010. ^ C.Michael Hogan. 2010. Fern. Encyclopedia of Earth. eds. Saikat Basu and C.Cleveland. National Council for Science and the Environment. Washington DC. ^ Gess, R.W. (2013). "The earliest record of terrestrial animals in Gondwana: A scorpion from the Famennian (Late Devonian) Witpoort Formation of South Africa". African Invertebrates. 54 (2): 373–379. doi:10.5733/afin.054.0206. ^ McGhee, George R. (2013). When the Invasion of Land Failed. New York: Columbia University Press. Ogg, Jim; June, 2004, Overview of Global Boundary Stratotype Sections and Points (GSSP's) https://web.archive.org/web/20060716071827/http://www.stratigraphy.org/gssp.htm Accessed April 30, 2006. "International Commission on Stratigraphy (ICS)". Geologic Time Scale 2004. Retrieved September 19, 2005.